Why sugarcoat it? When you’ve got something salient to say, go ahead and let fly. Such was the case a couple days ago when Kentucky Senator Rand Paul had some not-so-nice things to voice about a fellow Republican senator – and blurted them out (to the media). The words reverberated like thunder, but what Paul said started a discussion that needs to be held among Republicans…and everyone else in the country who values peace and cooperation. Diana Stancy Correll reported in the Washington Examiner , “Paul said he would not vote for an Authorization for the Use of Military Force against North Korea as [South Carolina neoconservative Sen. Lindsey] Graham had called for over the weekend, just before Trump’s meeting on Tuesday with Kim in Singapore. After over fifteen years in Iraq and Afghanistan one speculates Paul’s view is closer to the American mainstream than Graham’s since the notion of entering into another war isn’t considered publicly palatable these days. So, in essence, Paul was correct – Graham’s view is a danger to the country. Just the logistics of launching an attack on North Korea would be nearly impossible to accomplish without tremendous loss of life to U.S. forces, South Korean civilians and military personnel and a likely near wipeout of the North Korean populace. And for what? To rip Kim Jong-un’s finger off the red button? Since when was the threat of a nuclear strike enough to rationalize a preventative war? If that were the case the earth would already be one big smoldering wasteland many times over; doesn’t Graham recall the Cold War? What Graham said (about a war authorization) doesn’t make sense, but then again, the South Carolina senator’s been dribbling nonsense for well over two decades now. Perhaps Graham’s heartache over the depressing health deterioration of fellow neocon Sen. John McCain is causing him to be extra unreasonable these days. Without McCain around to make stupid irrational war pronouncements there’s only Graham remaining to beat the drum and carry the torch. For what it’s worth Graham fired back at Paul, declaring “When it comes to fighting radical Islam and bad actors, Senator Paul is constantly AWOL,” Graham said in a statement to CNN. “There is no threat to America that Senator Paul will not retreat from,” he added. When Sen. Paul ran for president (in 2016) he promised to battle radical Islam to the fullest extent necessary but would refrain from entering the country into costly overseas wars that have no end and produce no tangible benefits for U.S. security. Paul’s impressions were in the same ballpark to those of the eventual winner, Donald Trump. Graham and his ilk brand Paul (and by extension, Trump) as an “isolationist” (a pejorative term) because the latter favors a more restrained foreign policy rather than a strategy of committing the United States military to ill-defined armed conflicts half a world away involving uncompromising religious elements that have been warring for over a thousand years. In North Korea’s case the world is coming to grips with a potentially unstable tyrannical dictator who until recently rejected any and all overtures to communicate reasonably. That is until President Donald Trump came along. Trump met with Kim on Tuesday in Singapore, shaking hands and patting each other on the arm several times on their way to a one-on-one talk. As might be expected, nothing earth-shattering resulted from their first encounter – but you have to start somewhere. 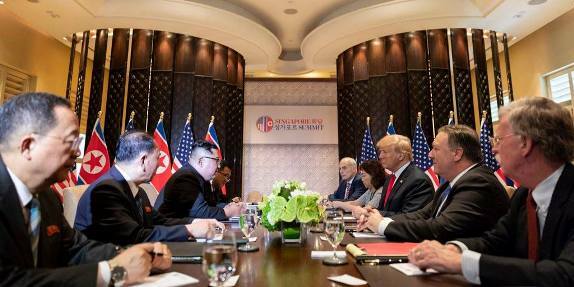 Gabby Morrongiello of the Washington Examiner reported , “President Trump said Tuesday North Korea has agreed to relinquish its nuclear weapons and is already ‘much further along’ in changing their behavior, and is prepared to rewrite history to push for a lasting peace and complete denuclearization of the Korean Peninsula. Trump spoke alone at the press conference because Kim had already rocketed (sorry, couldn’t resist) back to Pyongyang. The two sides apparently agreed to take a couple easily-identifiable initial steps to begin the peace process, including the U.S. voluntarily ending joint war games with South Korea and the NORKs consenting to dismantle a missile engine testing site. Trump even hinted if the process leads to its logical conclusion he will someday visit the North Korean capital and Jong-un would receive an invitation to Washington. One can only imagine such occasions are years down the line, but with the pace of events of late who knows – maybe they’ll be raising a toast to each other again next week and booking travel for Labor Day. Probably not though. Let’s not overlook, North Korea is still a rounding error of a country (with big weapons)… but it’s still only a blip on the radar screen of importance. The joint statement Kim and Trump signed and touted made big promises, such as complete denuclearization of the Korean peninsula – but contained few specifics, which naturally engendered a chorus of skepticism from critics . Trump’s political enemies aren’t about to give an inch on an issue that would all-but cement the outsider president’s legacy as a peacemaker; why not demand the moon now and gripe about every tidbit until it actually happens? The Tuesday meeting took on an almost surreal quality as the two leaders moved to greet each other in front of a stand of both countries’ flags. Many a mind must’ve wondered “is this really happening?” when Kim and Trump shook hands several times and appeared to exchange small talk  before disappearing behind closed doors to pore over the big concepts. Trump couldn’t help but jab at his predecessors in the post-summit press conference , arguing the peace process could’ve started years ago but didn’t because of a failure of political leadership. The Clinton and Bush camps aren’t going to like Trump’s assertion because it defies the conventional establishment wisdom that ancient conflicts are inherently unsolvable and theoretically a brash talking dealmaker could never be qualified to lead this great nation. No one’s saying Trump is the answer to every foreign policy dilemma that’s ever been but there’s no doubt his straightforward and honest approach is paying dividends now. Kim isn’t revealing why the NORKs are cracking after all this time, but whatever the reason an American president and North Korean dictator met face-to-face for the first time . There just aren’t many ways to spin this negatively – a dialogue has been initiated, relationships are forming and nuclear war seems a lot less likely today than it did even a few months ago. Trump is happy and hopeful but hasn’t gone overboard on enthusiasm. There’s reason for optimism but we’re only on step one of a thousand move continuum. If ultimately successful in this endeavor, Trump will go down in history as immensely proficient in the foreign realm. It could change American politics at home, too. Charlie Kirk wrote at The Hill , “America’s ‘best and brightest’ are not the people who inhabit elected political office long-term. America’s best are the men and women of enterprise. They are those in the private sector who innovate, take calculated risks, build things, grow things, produce wealth; they make decisions based upon opportunity for growth and return. Typical politicians make decisions designed to insulate themselves from risk and to enhance their power, privilege and prestige. “Donald Trump stepped straight into the Oval office as a titan of industry. He is now operating U.S. foreign policy as he would his business enterprise. He is maximizing the value of the U.S. brand. He is boldly stepping into new markets. He is looking at lost markets and deciding how to regain them. He is figuring out which are his non-productive divisions and jettisoning them. Trump’s business background and penchant for negotiating shouldn’t be dismissed here. As Kirk pointed out, Trump’s mission is to increase the “brand” of the United States where previous presidents sought security, friendships or maybe even their own personal place in history. Because Trump doesn’t own any specific ideological constituency it frees him up to work on making the most practical agreements. That’s why Trump doesn’t fear making the Canadians angry by jibing at our northern neighbor’s prime minister. It’s also the reason Trump can praise Kim Jong-un just a few weeks after insulting him. The novice politician did many of the same things during the 2016 GOP primary campaign, which drove media talkers crazy with his off-the-wall unorthodox approach to politics. Is everyone convinced Kim Jong-un and Donald Trump are the newest best international pals on the block? No, but in the end, it doesn’t matter; Ronald Reagan and Mikhail Gorbachev obviously established quite a personal rapport during the American president’s second term. Trump hoped to do something similar with Vladimir Putin before Democrats and the media decided it was more convenient for the United States to return to the days of seeing Russia as the Evil Empire. The weirdness of all of this will wear off in due time if Kim follows through on his vows and Trump continues to set a firm tone with the world, both friend and foe. “America First” is resonating but there’s still a lot of work left to do. Patrick J. Buchanan wrote at The American Conservative , “If Europe refuses to invest the money in defense that Trump demands, or accept the tariffs America needs to reduce and erase its trade deficits, what does he do? Is he prepared to shut U.S. bases and pull U.S. troops out of the Baltic republics, Poland, and Germany, and let the Europeans face Vladimir Putin and Russia themselves? “This is not an academic question. For the crunch that was inevitable when Trump was elected seems at hand. And that’s precisely what we’re getting. Democrats and the media hate it; they’d hoped Trump would’ve been easily manipulatable by the ruling elites and swamp establishment. Instead Trump does what he thinks best, always with a nod towards making America great again. President Trump’s meeting with Kim Jong-un the other day brought a terrific new prospect for peace and cooperation in an extremely volatile part of the world. Especially gratifying is Trump’s appreciation for the necessity of avoiding war at all costs. The Art of the Deal is alive and well.